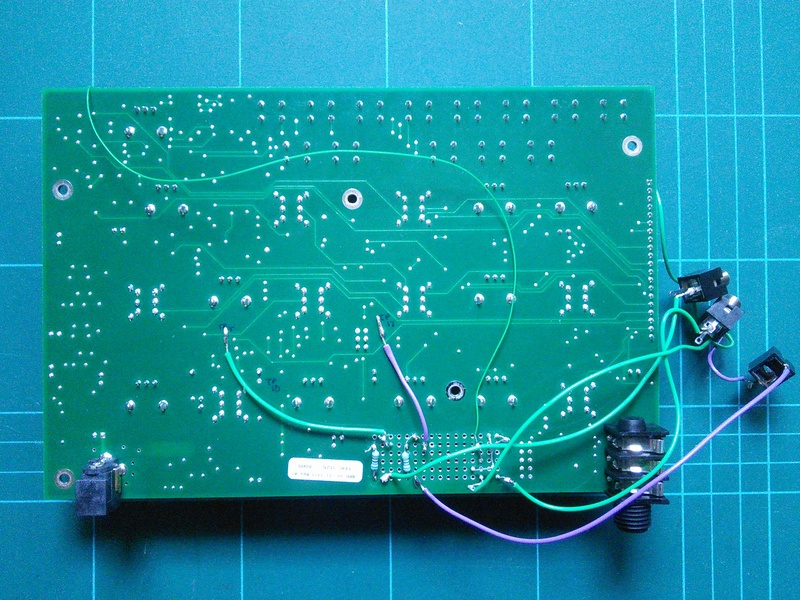 A blog about synths – making them, using them, and fixing them. There are three ways to get audio from your Werkstatt: the VCO direct out, the VCF direct out (both on the pin header), and the main audio out (the 1/4″ jack on the rear panel). The VCO Out signal is a sawtooth or pulse, depending which wave the VCO is switched to, at 0-5V. This is pure, dry VCO with no further processing, though of course it will be pitch- and/or pulse-width-modulated, depending on your modulation routings. 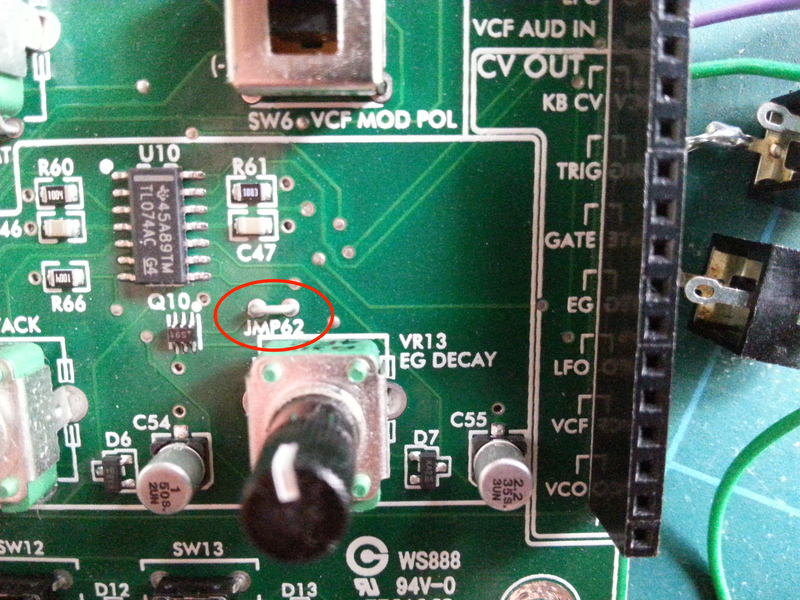 The VCF Out is taken directly from the output of the filter, bypassing the VCA, and is nominally -2V to +2V. The main audio out is at typical line level (a couple of volts peak to peak), and comes through the filter and VCA. 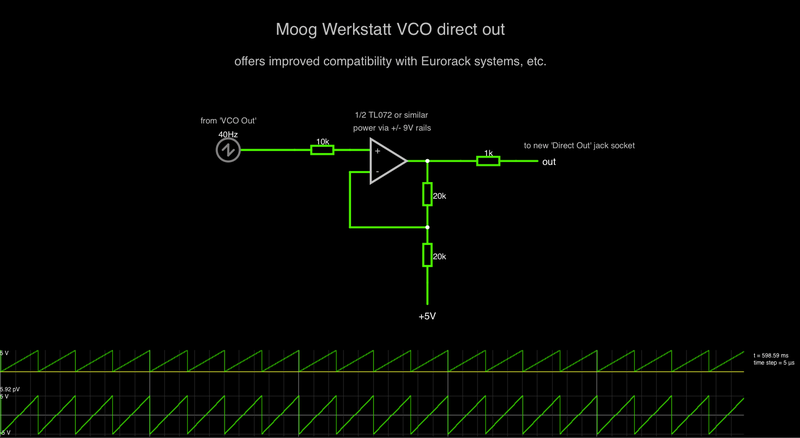 If you want to use the Werkstatt as an extra oscillator for a modular, for example, you’ll probably want to use the VCO direct out. If you’re running the filtered sound into an external VCA for more varied amplitude modulation or to use with a high-pass filter maybe, you will probably want to take the Werkstatt’s audio directly from the VCF out. If you’re using the Werkstatt as a standalone expander, the main audio out will do just fine. If signal levels were the same all the way along, none of this would be a problem. However, as with other aspects of the Werkstatt’s design, it needs some tweaking to integrate perfectly. Here’s how. Let’s say you’re using the VCO direct out. Eurorack has typical VCO signals of 10 volts peak-to-peak (see Doepfer’s Signals in the A-100 section, for example), centred around 0V (that is, -5V to +5V). To get the closest match sonically we want the Werkstatt’s output to match the other oscillators you’re using. Not all modules with mixers on board will boost as well as cut their inputs, so we can add a small circuit to give a true -5V to +5V VCO Out on the Werkstatt. 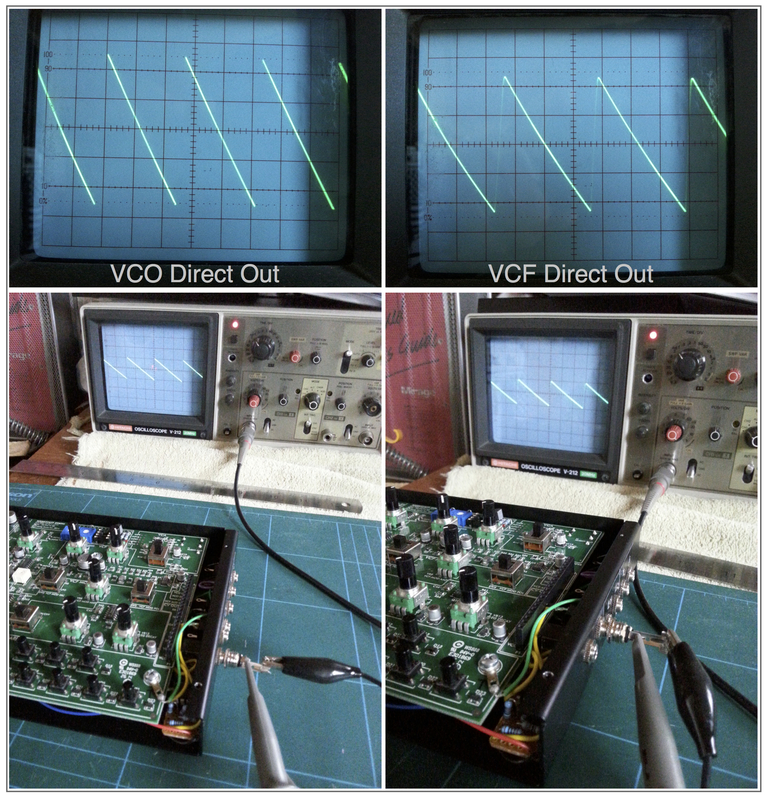 The schematic below shows both the VCO and VCF mods. More on the VCF shortly. 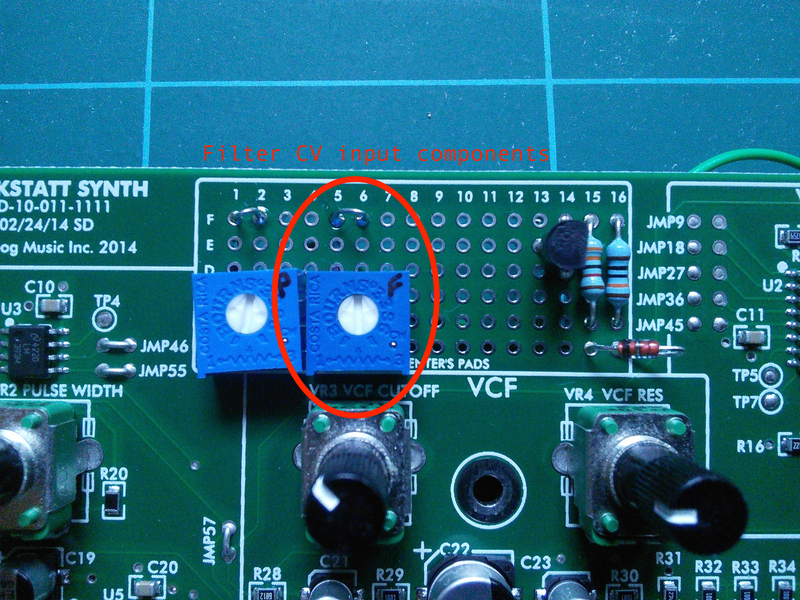 The VCO out mod is a basic non-inverting amplifier with an offset to make the positive-only signal bipolar. The gain is set by the two 20k resistors (1+20k/20k = 1+1 = 2) and the unity-gain reference point is at 5V. That is, 5V in gives 5V out. 0V in would be a difference of -5V from this reference point, so this is multiplied by the gain of 2 to give a difference of -10V, which taken from the +5V reference gives -5V out. In this way, the 0-5V input becomes -5V to +5V out. You can see it in action at this link. Below is a screenshot of the simulation. Likewise, if you want to run the Werkstatt’s VCF output into an external module, boosting the signal to match requires just a small circuit, almost identical to the first. The signal level drops as resonance is increased, but to keep our circuit simple we won’t worry about that. The schematic is on the same sheet as the VCO output, posted earlier on this page. This is also a non-inverting amplifier, but this time with no offset as the VCF signal is already bipolar – all the amplification happens around a 0V centre point. Positive signals get more positive, negative signals get more negative. The VCF direct out is normally about 5V peak to peak at maximum, so we just double that to get the more useful 10V range. The gain is set the same way as the previous circuit, and we get an output of -5 to +5V maximum. 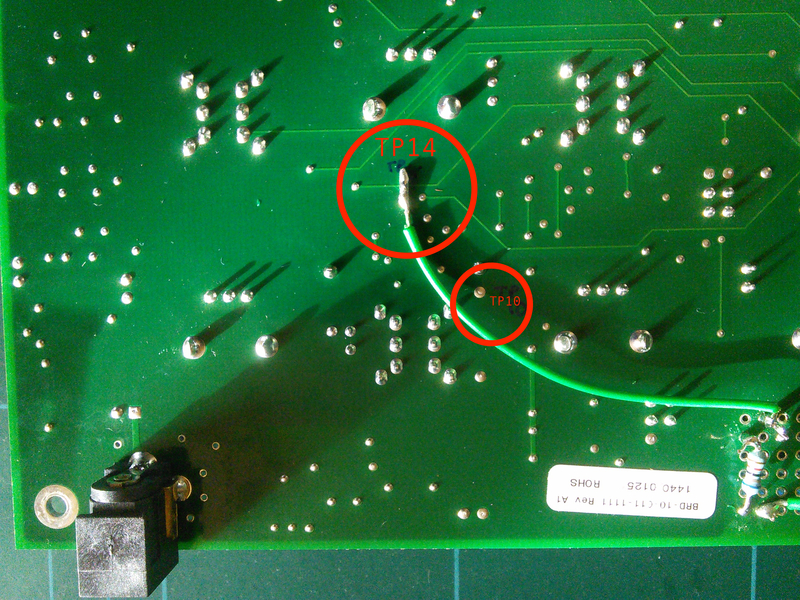 The photos show the locations on the PCB of the various supply rails you’ll be wiring up to: -9V and +9V to power the op-amp, +5V for the VCO amplifier reference, and GND. These are all labelled on the top side of the PCB anyway so it’s easy to find them. 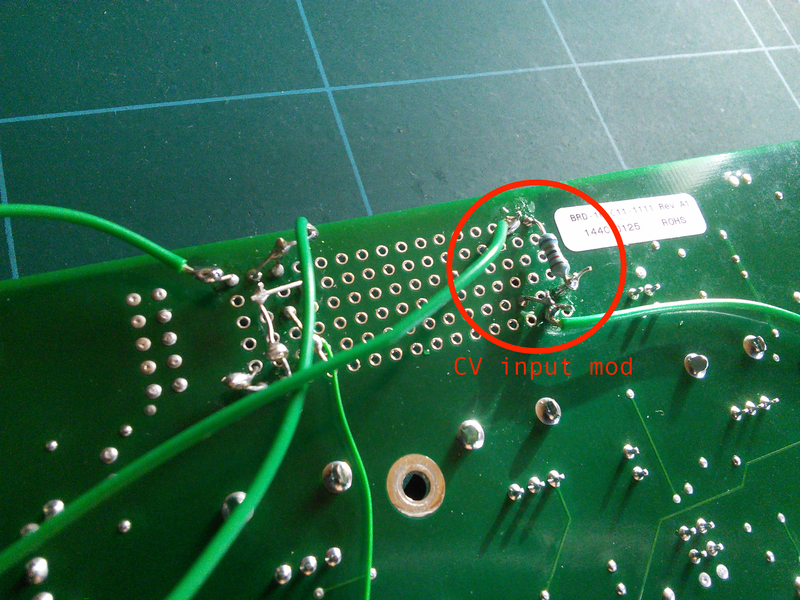 I shared the ground that my existing mods were already using, which is connected to the nearby screw post via a solder tag. See my CV mod for details. 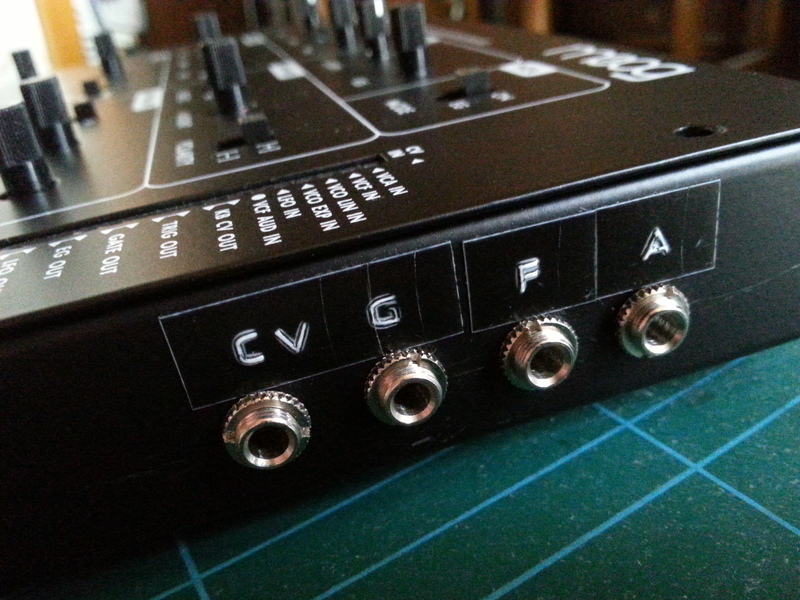 I’ve already blogged about the reasons you might want to mod your Werkstatt, and have posted a list of mods here, so to complete the VCO/VCF/VCA trio, here’s the VCA input at last! This is a very simple mod, and just replicates the existing patch header input. All you need is a 10k resistor, some wire, and a jack socket. As the Werkstatt already has a pin for VCA modulation on its patch header, you might think this mod seems less immediately useful than the VCO or VCF CV inputs. The main issue is that there is no way to simply switch off the Werkstatt’s own VCA – you can select EG shaping, or ‘on’ for drones, but you can’t bypass it for use with an external envelope. What does this mean in practice, and why bother adding a CV input for it? If you’re using the Werkstsatt with a modular, you’ll have more interesting envelopes than the attack-decay type on the Werkstatt. You might well also have something that will give an offset. It should be possible to use a negative offset to counteract the Werkstatt’s ‘on’ VCA CV, and mix in a more interesting envelope signal; setting the Werkstatt’s VCA to ‘on’ and feeding this CV input with that mix will then allow you to contour the Werkstatt’s VCA as you like. It would also allow you to use the Werkstatt’s own patchbay to feed the VCA with its LFO, and simultaneously blend another LFO in with this CV mod. Mixing different LFOs gives a lot of movement to a sound, and can be very enjoyable to play with. 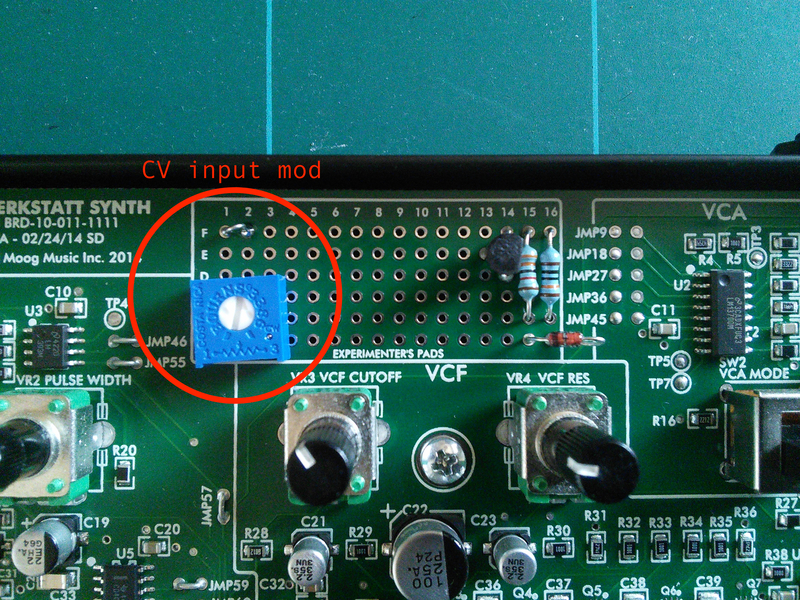 You can also sequence the VCA level this way, while retaining other modulation via the pin header. As always, my mods are not definitive – the best thing to do is experiment, and adapt, and find out what works for you and this excellent little synthesizer. Enjoy! 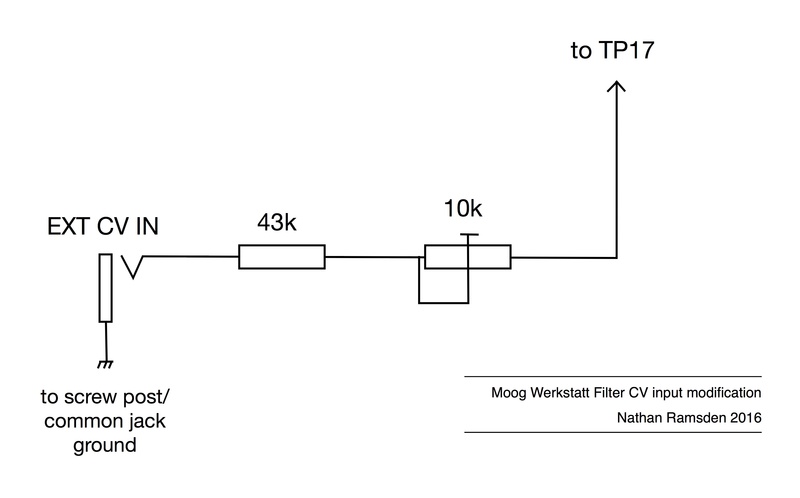 Note: I make reference to the Moog Werkstatt schematics throughout. Copyright prevents me reposting them here; they can be found on Moog’s website. After the VCO Frequency CV and Gate inputs, perhaps the next most useful control we can modify is the VCF cutoff frequency. 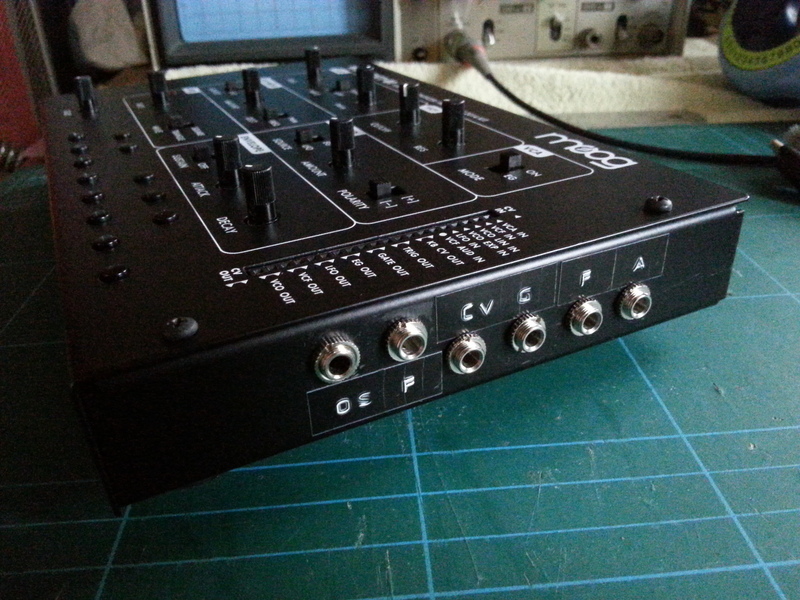 The Werkstatt already has switches to select either LFO or EG filter modulation in positive or negative amounts. 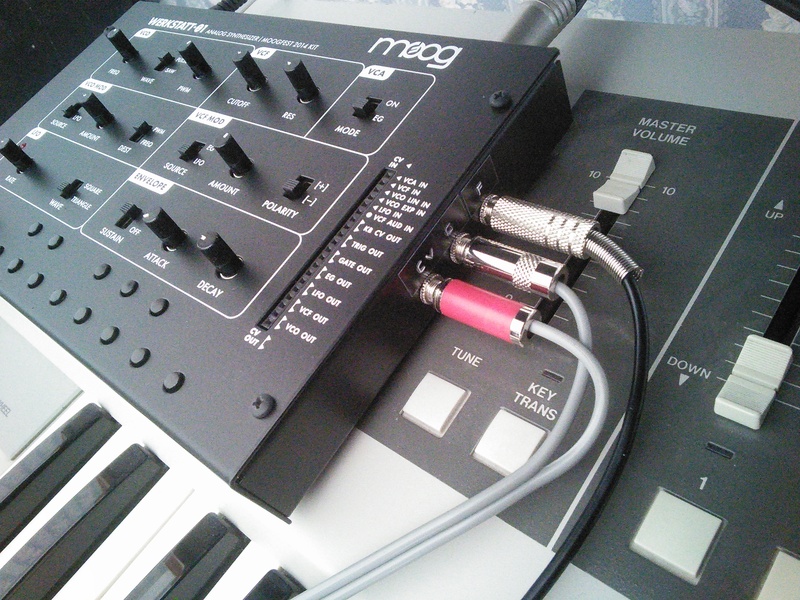 Many synthesizers also have a Keyboard Tracking control which routes the CV generated by the pitch control source to the filter cutoff, allowing the filter to open up as higher notes are played. The amount of this modulation is often governed by a pot — giving continuous variable control — but is also often implemented with a switch — giving either preset amounts of modulation, or at its most basic just on/off (that is, 100% or nothing). At 100% Keyboard Tracking, a self-resonant filter can be used as a sine wave oscillator, the pitch of which will follow the keyboard. The Werkstatt’s filter has a CV input on the header, which is fine for simple self-patching, but two problems show themselves when you want to control this parameter from an external source: firstly, the necessity of hacking a cable together as described previously; secondly, the accuracy of tracking. The Werkstatt’s existing filter CV input point does not, in my experience, give accurate 100% tracking from an external V/oct CV, which spoils sounds that require the resonance to boost harmonics that are locked to note pitch. The mod below overcomes these problems by giving the Werkstatt a separate, tunable Filter CV Input that can be trimmed to give suitably accurate pitch tracking. 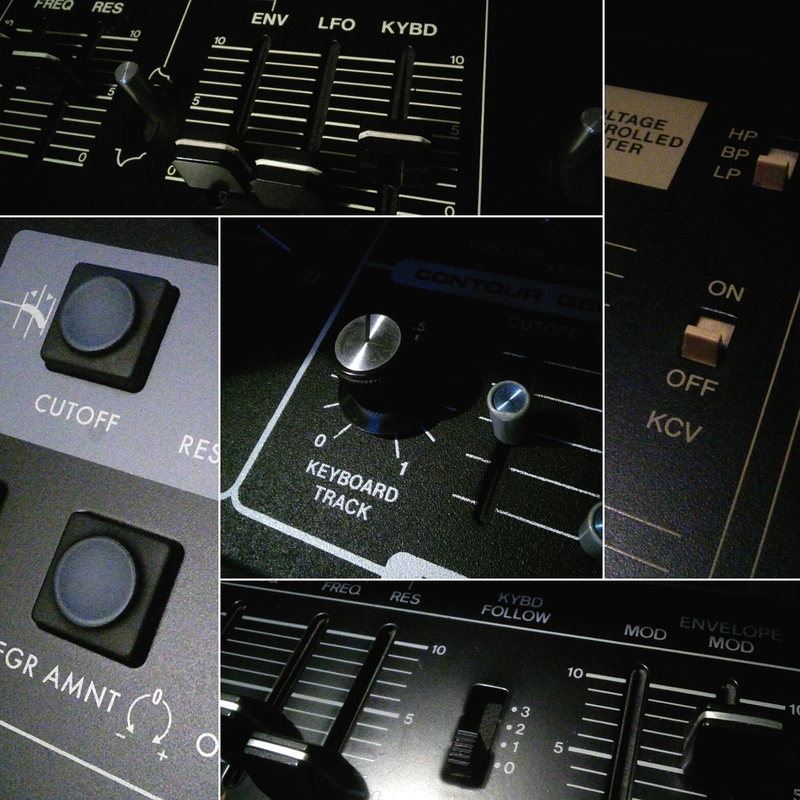 As with the Pitch CV Input mod, we’re going to simply duplicate the existing control input and make a slight alteration. The existing header input for cutoff control mixes its CV via a 47.5k resistor. In order to be able to give tunable tracking, this mod is going to use a 43k resistor and a 10k variable trimmer in series. 100% tracking should be somewhere towards one end of the trimmer’s range. Solder the two extra components to the board, take the third leg of the trimmer to TP17 (purple wire in the photos below), and take the outer leg of the resistor to the input jack, which is mounted and grounded exactly as for the CV and Gate jacks. Tuning the tracking is similar to tuning the pitch (a process described in the manual) — with the Werkstatt open, connect the external CV and play as normal, using full resonance on the filter, with the cutoff tuned so you can hear the pitch of its self-oscillation. Adjust the trimmer so the filter’s resonant frequency scales up the keyboard at the same rate as the note pitch — that is, two notes played an octave apart should give a resonant filter peak an octave apart. 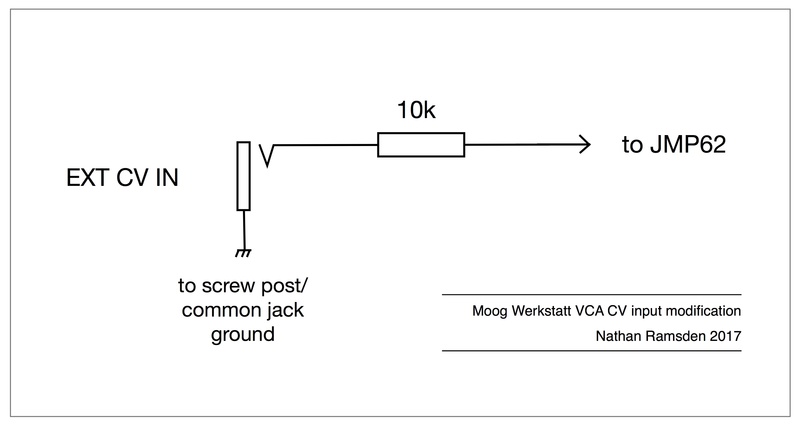 Because the Werkstatt’s VCO cannot be silenced without modification, it might be easier to disconnect the pitch CV control while tuning the filter; alternatively, if you have a way of multing the pitch CV, connect it to both pitch and filter. You might try setting the filter to resonate at an obvious harmonic such as a 5th above the pitch, as any deviation in the tracking will result in some noticeable sonic artefacts. Of course, you might not want a simple fixed 100% tracking filter. It would be possible to add a pot to allow the user to vary the tracking amount; you could install a switch to select between different resistors to give preset fixed trackings; you could route the pitch CV to a break-contact on the filter CV input jack so that it tracks by default unless a jack in insterted to over-ride it. My own mod is simple and quick and functional, and hopefully will provide a point of departure for your own experimentation. In its original form, the Werkstatt’s own keyboard generates the Gate signal to trigger the envelope, and there is no obvious ‘Gate Input’ on the header. The existing Gate Out can be (ab? )used as a Gate In, but it’s not ideal, because as with most of these header points, anything coming in here isn’t buffered from the internal signal. Adding a proper Gate In to the Werkstatt is straightforward enough, though a little more involved than the CV input; my approach doesn’t require the cutting of any traces, the only hack-work being the hole in the enclosure for a jack socket. It does require the end of one wire to be soldered to rather small SMT (surface-mount) components though, so you’ll need a suitably fine tip for your iron and a steady hand. 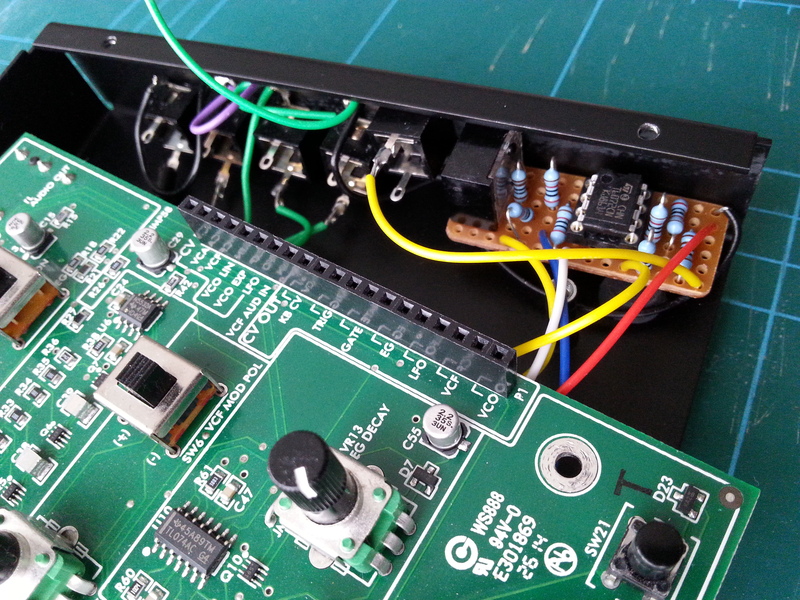 The Werkstatt’s keyboard scanner outputs a logic high at U19 pin 3 when it detects a key press. As well as stopping the scan and loading the current key value into a latch (which feeds the VCO CV), this signal is buffered to provide a Gate, and differentiated to provide a Trigger. The Key On signal is buffered inversely by the Schmitt trigger of U14-F before being flipped back positive by U14-D. 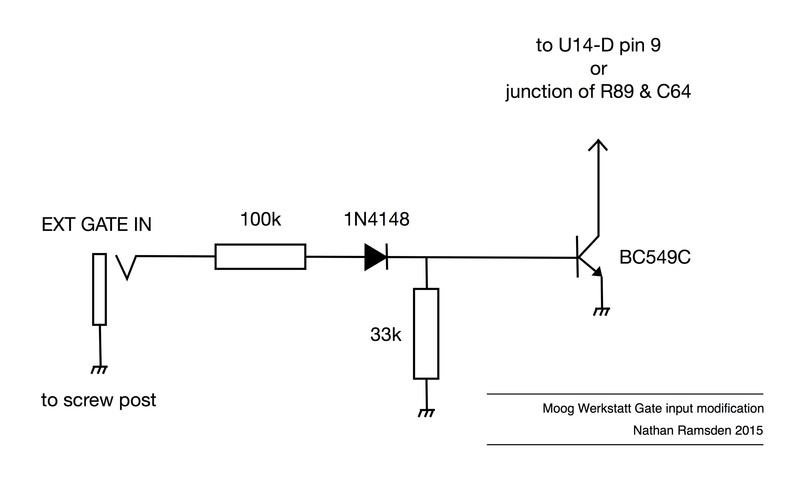 In order to add our external gate without affecting any other part of the keyboard circuit, we only need to bring the input of U14-D low. In this way, we can use both the Werkstatt’s own keyboard and an external Gate without having to switch between control sources. The solution is to use a simple NPN in saturation to take U14 pin 9 to ground when its base is taken high. 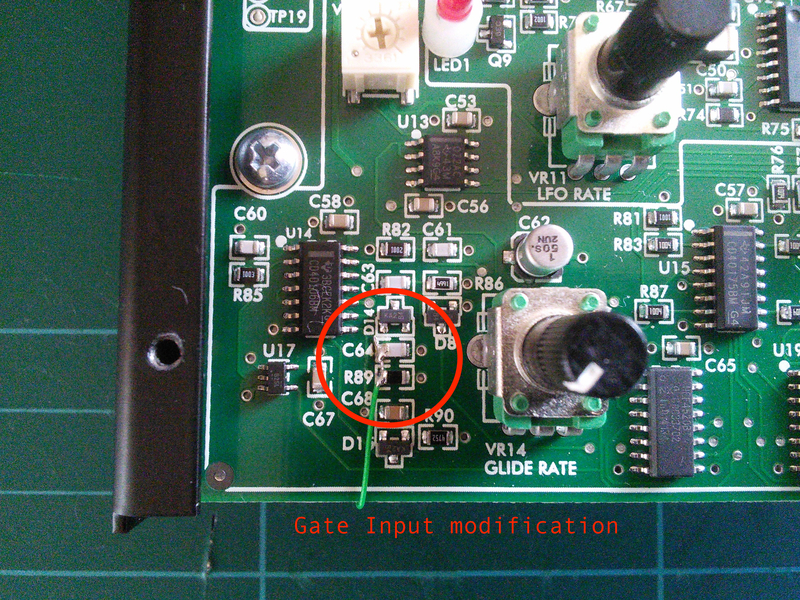 In other words, a positive external Gate will take the gate inverter input low, just as does the keyboard gate detector. 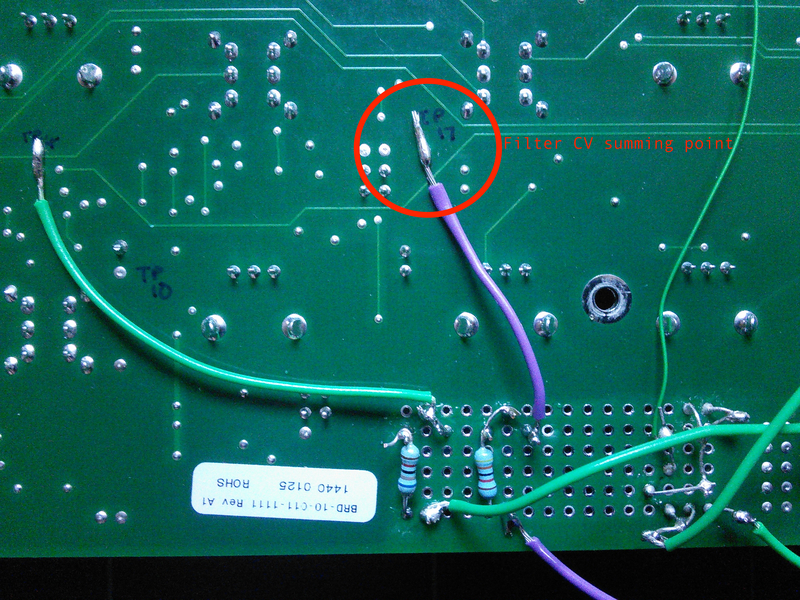 Because there is a diode in the way (D14), our added transistor is isolated from the keyboard scanner clock and data-bus, so there won’t be any accidental mis-readings of the keyboard CV. Another advantage of this solution is that the Werkstatt’s own envelope retains its Gate/Trigger operating modes, as our external Gate also gets differentiated; we are activating the Werkstatt’s envelope, not over-riding it. 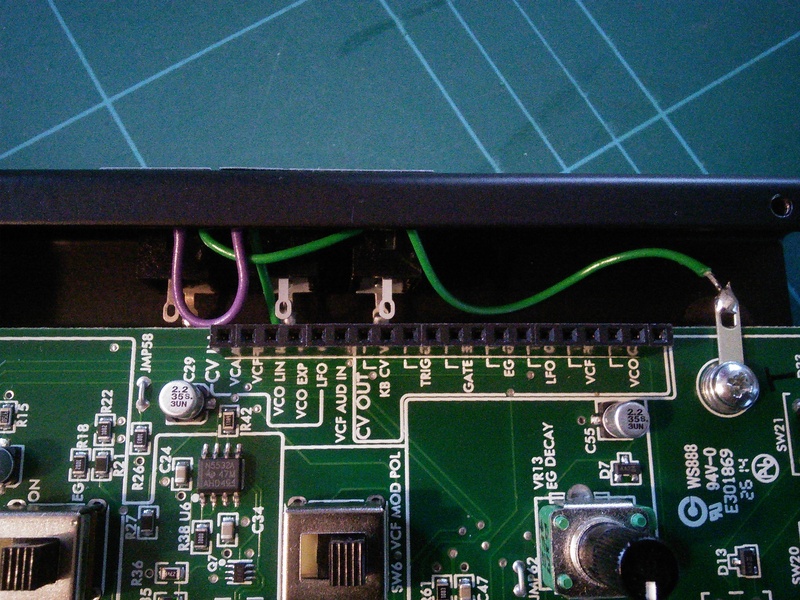 The modification takes just four components and a socket, and fits easily on the PCB. 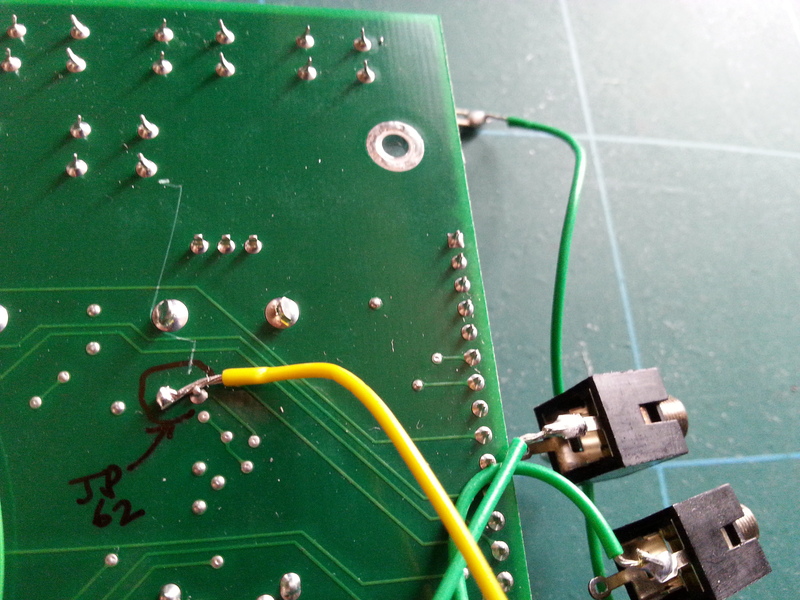 The hardest part is soldering the wire from the collector of the transistor to the appropriate point on the Werkstatt’s circuit – I chose to solder it across the connection between R89 and C64, as the two solder points make a convenient place to lay a thin wire and give it a firmer purchase. 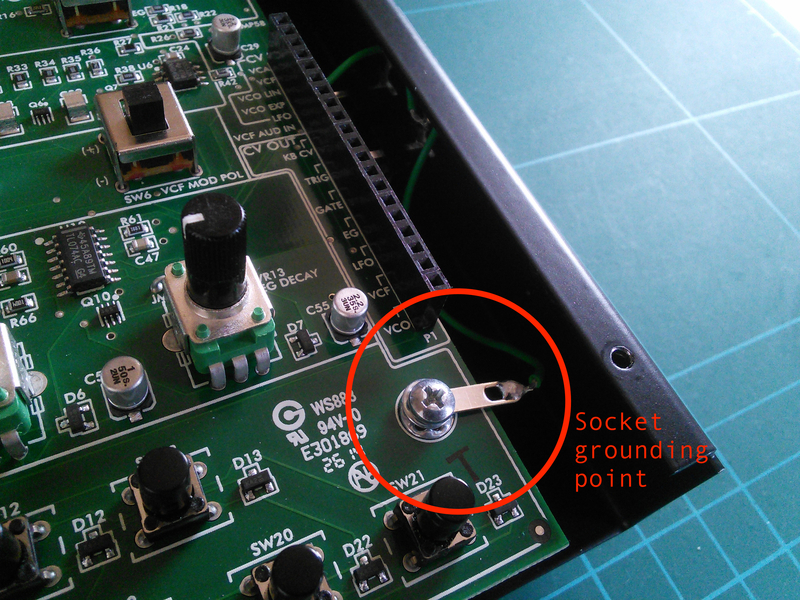 I presume you’ll be doing both CV and Gate input mods; the socket ground can be wired to the CV In socket ground, which I wired to a solder tag around the nearby PCB mounting screw (see also the CV Input page). These parts are what I had handy. Pretty much any NPN with reasonable gain can be used here, and the signal diode is a generic one. 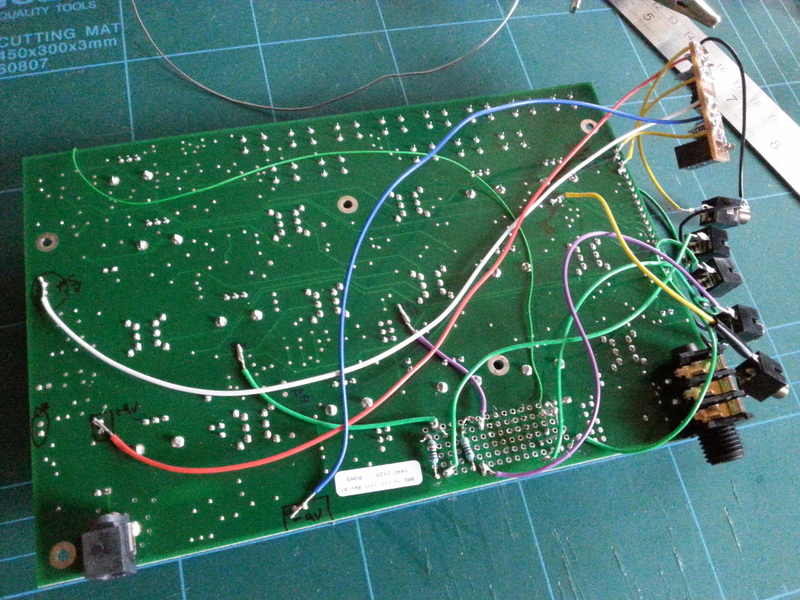 The existing header on the Werkstatt allows for a VCO pitch CV to be patched in. Although the pitch can already be modulated by either the LFO or the EG (selected using a panel switch), the patch header input means you can use both modulation sources simultaneously – or an external CV, if you can cable it up. 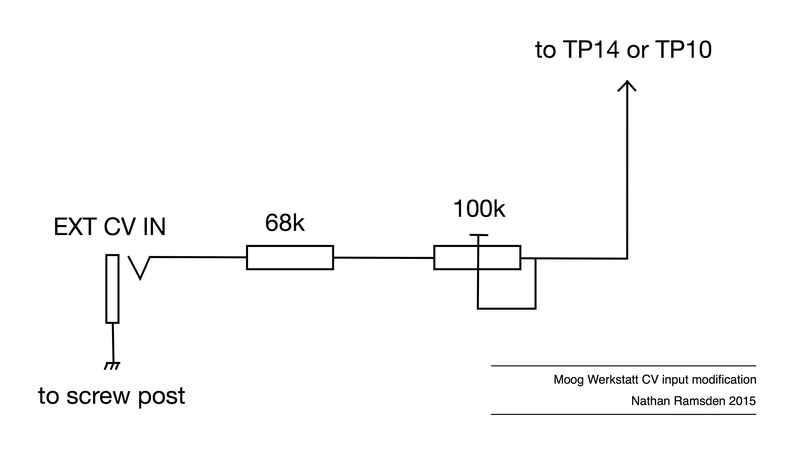 When you start wanting to connect control sources to the Werkstatt, one problem is pretty obvious: the patch pin header provides a signal path, but there’s no ground. The user manual suggests hacking cables together, taking a ground from the cable to a screw on the case (or the ground on the audio output jack), but this isn’t a very neat solution. 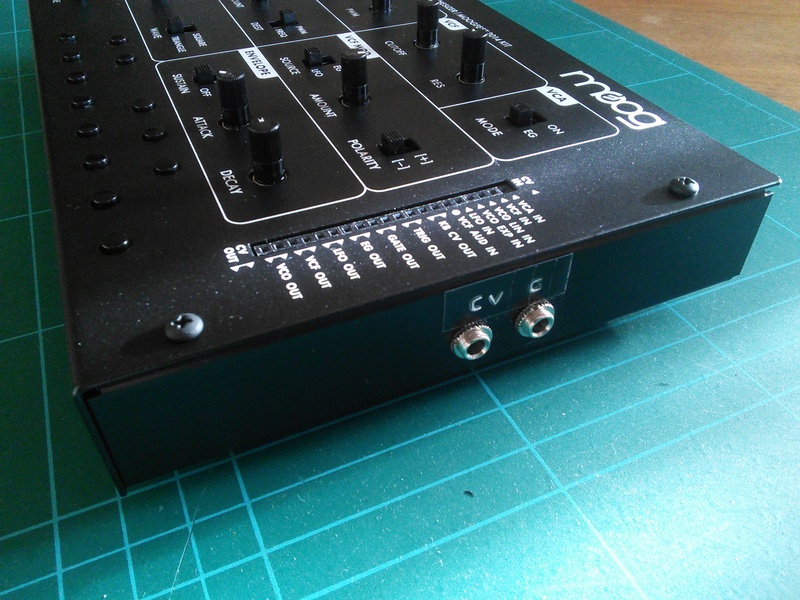 Better to add a proper CV input jack so you can directly and simply hook up your external CV source using standard cables. Moog themselves (at the time of writing) do sell an add-on jack board, which provides both a row of minijacks and a signal ground, but I decided against buying it for two reasons: 1) it still doesn’t offer a true Gate input, which I felt necessary; 2) the jack board replaces the patch pin header – adding mods like mine means you can use them and the patch pins simultaneously, giving more possibilities. The circuit is very simple. Looking at p.2 of the official schematic, we can see the existing header CV input is mixed in via a resistor R46 and trimmer VR5. This trimmer can be carefully adjusted to give a 1V/octave response for your external CV. It would be super-easy to simply wire a jack to the CV point on the header, but this has the disadvantage that inputs are not isolated from each other. 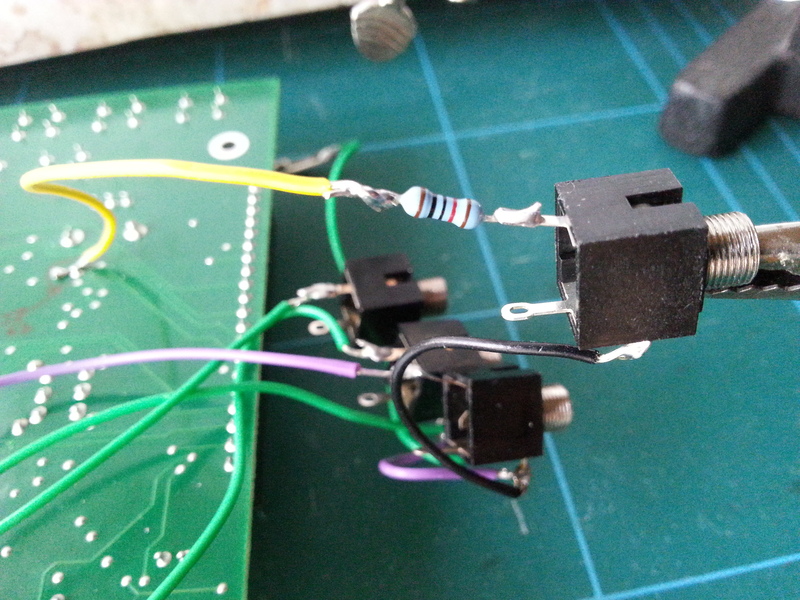 Better (and still easy) is to replicate the two passive components and route them to the same mix point. The accompanying Gate Input mod is also detailed on this site.